What do you associate with the color pink? Love? Romance? Valentine’s Day hearts and flowers? Cotton candy or a baby blanket? Truth be told, pink represents many pleasant aspects of life. What if this color was used to encourage happy emotions and combat negative ones? This is the thought behind a color psychology experiment being implemented in some correctional facilities. In other words, prison walls are being painted pink. Many color experts would agree, saying some shades of pink are believed to have calming effects on emotions. In theory, pink should act as an energy zapper, hopefully putting a stop to conflict before it starts. What is the Shade of Prison Pink? The popular prison hue is known as “Drunk-tank Pink.” The official title is Baker-Miller Pink (R:255, G:145, B:175). Choosing the right shade of pink is important for this color experiment. As one color psychologist points out, “Not all pinks are created equal.” There is some debate over whether or not pink has calming properties. More research still needs to be done on which pinks prove to have soothing effects in intense environments. Another argument surfacing about the power of pink is how long feelings of relaxation last. Some sources say the positive sensation will only last for a short period of time. It is speculated that within 15-30 minutes of exposure, the body will return to aggressive instincts. Others believe that it is physically impossible to feel uneasy in a pink environment. One biosocial researcher claims, “The heart muscles can’t race fast enough,” in this type of setting. Will this technique work? Can the color pink limit violent and aggressive behavior in inmates? 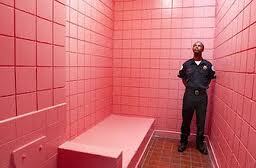 Pink may not create a utopian society within prison walls, but many facilities are willing to test the theory. How does color effects your emotions. Have you noticed calming effects when in pink environments? This entry was posted in "out of the box" art, aggressive behavior, art therapy, Color, color experiment, Color psychology, Color Therapy, Pink, prison, shades of pink and tagged Baker-Miller Pink, Color Experiment, color therapy, iPad, iPhone, Paint by Number, paint by numbers, Pink Prisons, Prison, Segmation, Shades of Pink, Variations of pink on July 24, 2013 by segmation. Your blog covers the most interesting topics related to art! Thank you. Do you have a favorite? No. I’m always pleasantly surprised at what you write about. Great post. As a psychology student, I’d predict the effects would only be short term. I haven’t looked at the literature but I have heard this idea before. I’d love to see whether there’s an effect of some kind. Pink is the new orange which is the new black. I would have thought that blue, being a calming colour, would be ideal. I have to question then if there is some underlying reason we put girls in pink clothes… would wearing pink mean people would be less aggressive towards them? I doubt having pink walls would make someone less aggressive in the long term.